Stretch Marks are visible lines and bands on the skin caused by stretching of the skin’s connective tissues. These lines are of a different texture and color from the normal skin, ranging from purple to bright pink to light gray. They commonly appear on the skin during or after a pregnancy, or after a dramatic change in the body weight. Stretch marks vary in size as well the location of their appearance. The Cost of Laser Stretch Marks Removal depends upon the area and the condition of stretch marks being treated. Stretch marks can appear anywhere on the body, however, the most commonly do so on the abdomen, breasts, thighs, buttocks and underarms. Once they appear, a qualified doctor is supposed to review them medically. An appropriate treatment plan is then suggested to the patient. 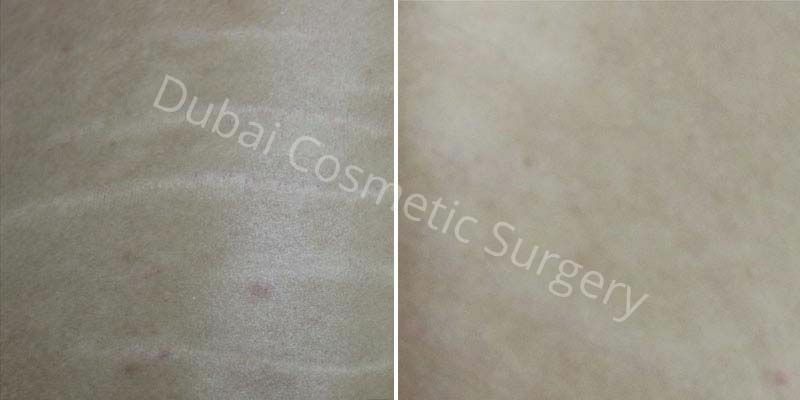 If you too suffer from stretch marks on your body, then you can have them removed or diminished through Stretch Marks Removal in Dubai, Abu Dhabi and Sharjah. 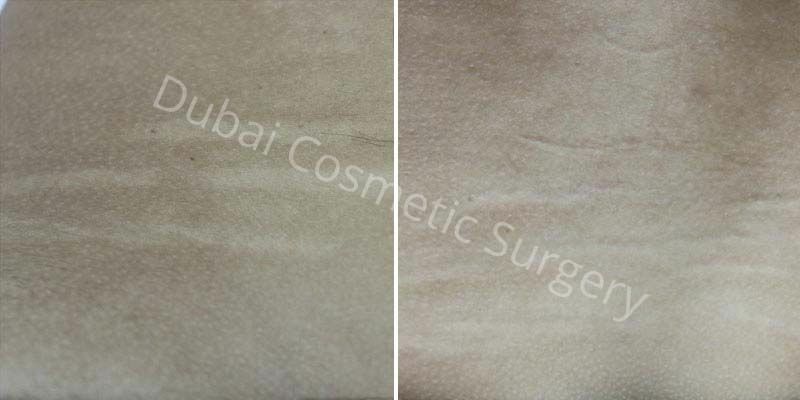 The treatment can either remove the marks completely or lighten their visibility to an extent that they don’t seem noticeable. No Guarantee, as the results may vary from person to person. You have stretch marks on your body caused by weight gain, muscle gain, puberty or pregnancy. You don’t smoke or consume alcohol. You have reasonable expectations from the treatment. You are in a good overall health. Diminish the appearance of stretch marks. Enhance the appearance of the skin. 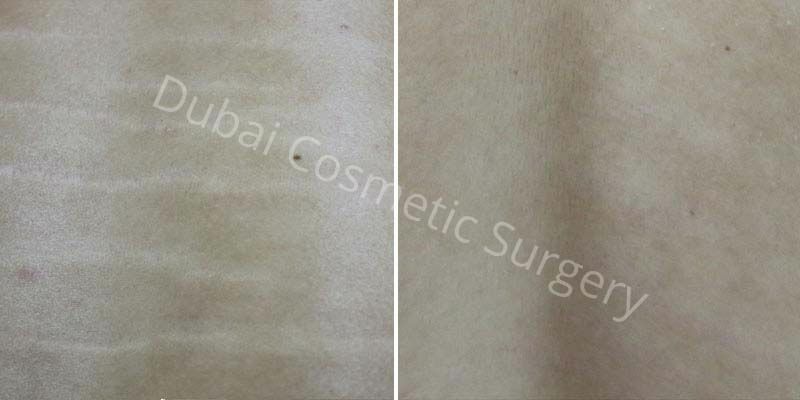 Stretch Marks Removal is usually a permanent and a very safe treatment to enhance the appearance of the skin by reducing the visibility of stretch marks. Laser Treatment – This procedure involves using laser wavelengths to remove thin layers of skin around the stretch marks. Different lasers target different types of stretch marks, which can be darker or lighter. The heat from the laser light is absorbed by the skin, which also triggers the production of elastin and collagen, thereby restoring the skin’s elasticity. 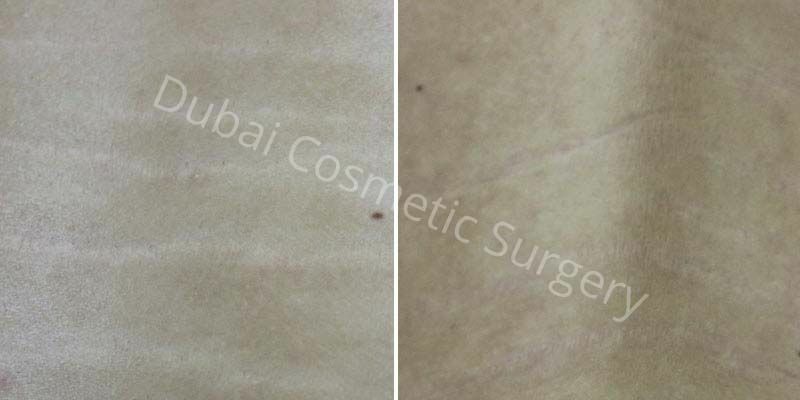 Once the stretch marks have been targeted and removed, the treated area will heal quickly and new skin layers will emerge in place of the old ones. Surgical Treatment – If your stretch marks are found in the abdominal or the thigh region, they can be permanently removed through surgical procedures. A tummy tuck and thigh lift remove excess skin from the abdominal and thigh region and tighten the remaining skin and tissues. As a result, the stretch marks in these areas are gone forever. Chemical Peel – This procedure involves applying a specialized solution to the area of the body where stretch marks are found. The solution peels off the top layer of the skin and stimulates the production of new skin cells. As a result, the stretch marks fade away or become less noticeable. Sometimes, multiple treatments are needed to achieve optimal results. Microdermabrasion – It works much like chemical peeling by removing the top layer of the skin, however, instead of using a chemical it uses fine crystal spray to blast the outer layer. As a result, dead skin cells are removed and new skin cells emerge in their place. This makes the stretch marks less noticeable. A Stretch Mark Removal treatment is a relatively simple procedure, which doesn’t require a lot of pre-op preparations. You can drop into your surgeon’s office at the appointed time, get the treatment done, and then leave the clinic the same day. There’s no overnight stay involved either. However, you’ll still need to take some precautions before the surgery, including the following. Quit smoking and consuming alcohol for about a week before the treatment, because it can affect recovery. Keep the area that needs to be treated clean. Don’t consume aspirin or anti-inflammatory drugs because they can thin the blood. Get all the lab tests done to ensure your suitability for the treatment. A Stretch Mark removal surgery is performed on outpatient basis and it usually takes around half an hour for the procedure to finish. The procedure of the treatment depends on the technique your surgeon is using, however, it will roughly be in the following order. Your surgeon will first apply local anesthesia to where the stretch marks are found to eliminate any pain and discomfort during the procedure. Then depending on the technique, your doctor will carry out the required steps. In case of surgery, incisions at appropriate sites will be made to remove excess skin and tissues. For other techniques, the surgeon will work on top of the skin. The skin will then be bandaged and left to heal. If need be, the technique may be repeated again. No downtime, in case of non-surgical treatments. Get rid of excess skin as well, in case of surgical treatment. 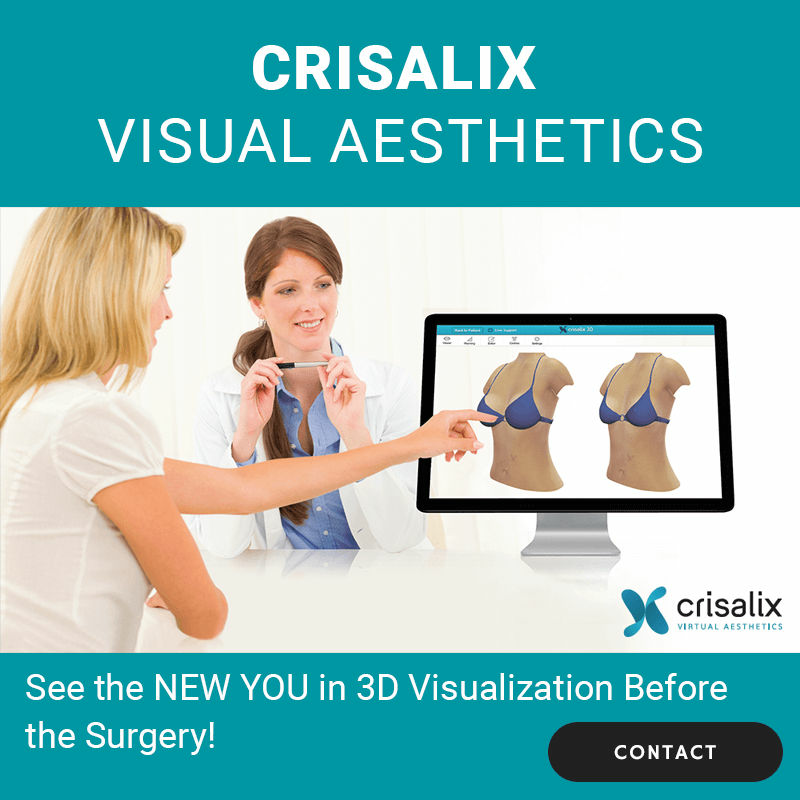 The procedure is painless, efficient and delivers permanent results. The treatments is known to boost self-esteem and confidence. Stretch Marks Removal treatment is usually a quick procedure and thus it has a small recovery period. For surgical techniques, the recovery may be slightly longer. You’ll be good to go around within a couple of days of the treatment, however, you may experience some of the following conditions before you recover fully. Redness, swelling and bruising in the treated area. Slight pain and some discomfort after the treatment, which can be dealt with medications. Tightness or pulling sensation in the skin. Taking prescribed medications to relieve pain and discomfort. Limiting your physical activities and avoiding vigorous activities immediately after the treatment. Keeping the wounds dry, in case of surgical treatment. Wearing compression garment for recommended period of time, in case of a surgical treatment. The results of Stretch Marks Removal treatment are usually permanent. If you take good care of your body after the treatment, the marks are highly unlikely to return. If you plan to undergo our Stretch Marks laser Removal treatment with low cost then you’ll be happy to know that we’re offering free consultations to all of our existing and new clients. You simply need to fill the form below and one of our representatives will get back in touch with you shortly. 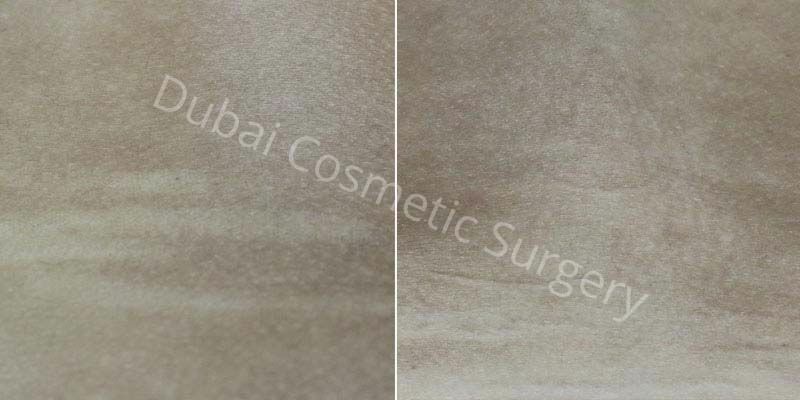 She’ll be more than happy to arrange your free consultation session with one of our highly trained and qualified Stretch Marks Removal surgeons in Dubai, Abu Dhabi and Sharjah. You can then discuss anything that is on your mind—without any follow-up obligations. Stop waiting and book your free consultation NOW! You Don’t Want to Miss This - We have a Special Offer on Stretch Mark Removal For You. You are just a step away!